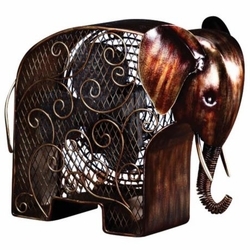 A playful, decorative figurine fan in the shape of an elephant. This is a collectible piece especially for the elephant aficionados! This figurine fan offers a cool breeze and playful decoration. Made of high-quality cast metal and presented in a mottled brass finish. This elephant will never forget to cool you off on a warm day! • 1 year limited manufacturer warranty.